SQLite databases on Android devices are very stable by definition. However, we have experienced that databases can be corrupted. This may be due to wrong closing the database or killing Locus app. The result is that Locus Map is not able to open the database file or the file deletes itself - this concerns both map files and points/track databases, all are SQLites. 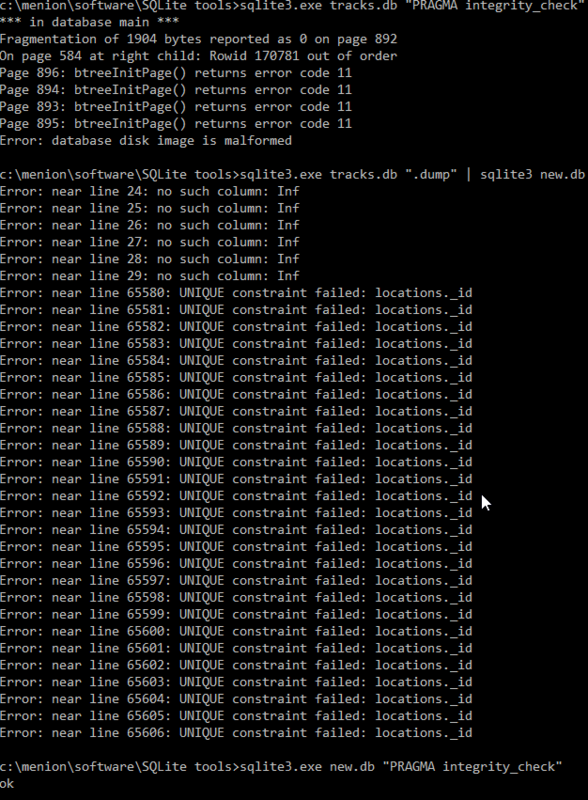 Luckily sometimes it is possible to repair such a corrupted database. Following steps require working with the DOS command line (cmd). to verify database. Result will be probably error message Error: database disk is malformed. If you repeat above integrity check on a new.db file, you should get “OK” message. However, this procedure is not always successful. The easiest and most reliable way is to restore the database file from the backup.